Located in Goa, Ocean Palms is 600 metres from Calangute Beach. It offers 2 dining options, an outdoor pool and spacious rooms with a flat-screen TV. Free internet access is provided in the lobby lounge. Rooms at Ocean Palms Goa feature modern interiors and large windows that offer plenty of natural light. All have a minibar, personal safe and sofa seating area. Shower facilities and toiletries are included. Guests can work out at the fitness centre or enjoy a body massage at the spa. Airport shuttle and car rental arrangements can be made at the 24-hour front desk. Available for all-day dining, Nautilus restaurant offers a buffet spread of local and European dishes. Light snacks and refreshing beverages are served at Beachcombers Lounge. 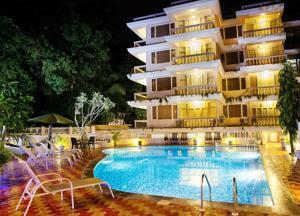 Goa Ocean Palms is 2 km from Kaliz Art Gallery and 4 km from the Light House Fort Aguada. Panaji is 12 km away. Wi-fi is available in the hotel rooms and costs INR 100 per hour. Free! Up to two children under 5 years stay free of charge when using existing beds. One older child or adult is charged INR 1500 per night and person in an extra bed. Maximum capacity of extra beds in a room is 1. Any type of extra bed or child's cot/crib is upon request and needs to be confirmed by the hotel. Supplements will not be calculated automatically in the total costs and have to be paid separately in the hotel.